Without doubt Billy Mandindi was one of the most exciting artists to have emerged through the community arts sector in the 1980s. Viewed by some contemporaries as a teen prodigy, Mandindi’s precocious talent is clearly visible in early works such as Man amongst men (plate 241) where he skilfully juxtaposed divergent modes of drawing (naturalistic, expressionistic, comic, and iconic) with vivid allusions to imperialism, oppression and resistance. Similarly, African Madonna (1986) (plate 240) seamlessly blends conventions derived from the Italian Renaissance with symbols of indigenous power as well as economic exploitation. African Madonna is a direct reference to Nonqawuse, the young girl whose prophecies led directly to the subjugation of the Xhosa by the British settlers. Seen in this context the painting is an eloquent testament of the link between Nonqawuse’s prophecies and the beginning of labour contracts and migrant labour, making the work a sophisticated narrative. With his earlier print triptych Prophecy (1985) (plate 239), Mandindi dealt with the theme of Nonqawuse by contextualising her within the contemporary struggle against apartheid, suggesting that the liberation prophesised by her was still to come. Other early works such as The death of township art (1989) (plate 233) address the loss of innocence that came with political resistance, in particular the practice of ‘necklacing’ suspected informers, a theme dealt with elsewhere by Mandindi as early as 1986. This loss of innocence applies both to politics: the ‘comrades’ here are deadly angels; as well as to art: picturesque images of Africa are no longer valid. The death of township art poses a critical question about the nature of the art required within a period of intense political conflict. Mandindi addresses a related issue in his print What about the artist and the sculpture? (plate 421) which is very much a product of the early 1980s. Following Albie Sachs’ influential paper, Preparing for Freedom, artists who had positioned themselves as part of the resistance movement began questioning the constraints of an explicitly political art. An interesting feature of Mandindi’s works from the late 1980s and early 1990s is the sense of eclecticism and hybridity that is evident in much of his imagery. It is possible to view these developments in his work as being in tune with international trends at the time, yet Mandindi’s art is driven more by his own concerns to express conflicts that are both political and personal, and this gives his works an authority that defies the shallow display of eclecticism for its own sake, which is a hallmark of much Post-Modernist art of the period. Indeed Mandindi’s symbolism is frequently unsettling, and in most instances derives much of its strength from being exceptionally lucid on a visual level whilst simultaneously defying easy interpretation. Some works such as Recalling Amalinde (plate 237), a reference to one of the frontier wars in the Eastern Cape, are perhaps easier to interpret but more often, as with Feast (plate 234) and Ritual (plate 235) the intentions of the artist are difficult to decipher. In these cases the absence of an easily-read narrative is rendered almost irrelevant by intense, evocative imagery that suggests that the works are as much about internal, psychological struggles as they are about external conflict in the ‘real’ world. Several of his works, especially his graphics, also frequently blur the distinctions between surface pattern (‘decorative’ elements) and symbols that embody ‘meaning’. The multivalence of Mandindi’s content finds its equivalent in his imagery, as in the representation of the schoolgirl in Ritual, who appears to be both victim and protagonist. Regrettably Mandindi’s personal demons have not always been contained. The very qualities that make his early works so powerful have proven to be challenges to the development of his career, and the quality of his works has fluctuated considerably. It remains to be seen whether he will be able to regain the momentum and consistency that characterised his early works, works which not only beg comparison with some of South Africa’s finest (Dumile Feni (qv.) and Trevor Makhoba (qv.) come readily to mind) but also with the best of early works by the Mozambique artist Malangatana Valente Ngwenya. The text above was written just before Mandindi died. It has not been amended to take on the form of an obituary, since it seemed to be a more fitting tribute to go to press with an account of challenges faced by Mandindi, both artistic and personal, that were written with the expectation that he would read this text for himself. Decisions to exhibit many of his works in ReVisions, and to include his work on the cover of the catalogue were taken before Mandindi’s final illness, and approved by him, and it appears appropriate to retain the form that tribute was being paid to him in his own lifetime, rather than to posthumously succumb to eulogies and romanticisation, to statements that may not have come as easily in his presence as they do in his absence. Born Cape Town, 1967; died, Cape Town, 2005. 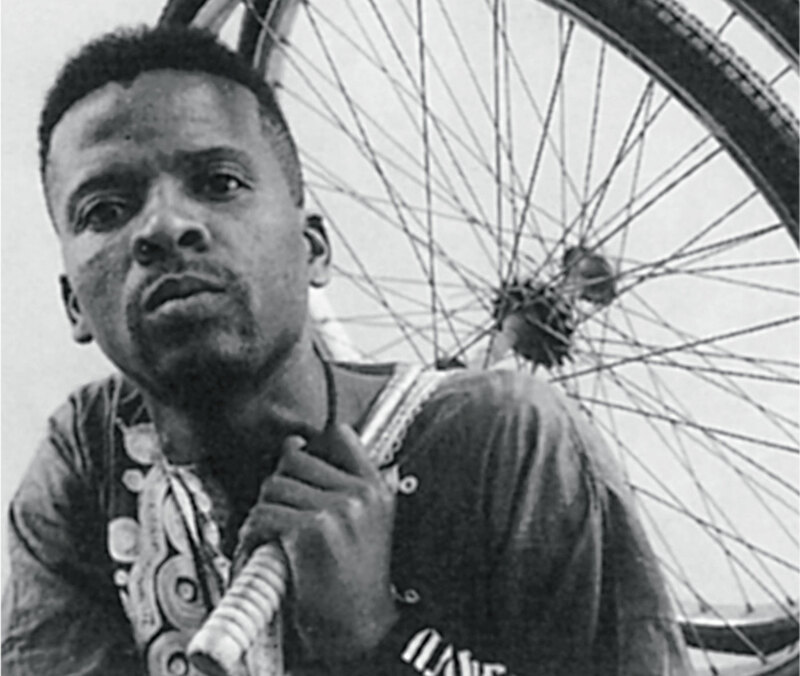 Training 1985–1986: Community Arts Project, Cape Town. 1987–1988: Casual student, Michaelis School of Fine Art, University of Cape Town. Exhibitions 1986–2005: Participation in several group Exhibitions, including at the Iziko SA National Gallery, Cape Town; the Museum of Modern Art, Oxford; and Africus Biennale, Johannesburg. 1996: Container ’96 Art Across the Oceans, Denmark (in collaboration with Gavin Younge). Collections Iziko SA National Gallery, Cape Town; University of the Witwatersrand, Johannesburg; University of South Africa, Pretoria; University of Stellenbosch. Photograph of Billy Mandindi. Sue Williamson and Ashraf Jamal. 1996. Art in South Africa: The Future Present. David Philip: Cape Town. p. 144. Photograph by Mark Lewis.